Murchison Falls is the largest national park in Uganda. 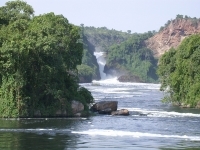 While lacking the gorillas that make other parks famous, Murchison Falls itself is a popular tourist attraction. The waters of the Nile River squeeze themselves through a narrow gorge only 23 feet (7m) wide, and then plunge 141 feet (43m). There is plenty of wildlife to be spotted in Murchison Falls National Park, including the 'big five'; elephants, lions, leopards, and buffalo can be seen in the park, while rhinos (poaching to extinction by 1983) are bred in nearby Ziwa Rhino Sanctuary. Game drives are a popular activity in Murchison Falls National Park, as are river cruises to spot hippos and crocodiles. Chimpanzee trekking is also available.